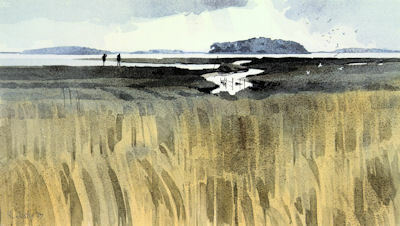 The Arne peninsula is a fine and quiet place on the far edge of Poole Harbour from the town of that name. Here the bustle of a port and the constant ebb and flow of boats, large and small, gives way to the gentler ebb and flow of the tide and the calls of birds. Showers and clouds glide past over a wide horizon. Ronald captures the slightly sinister atmosphere of the place to perfection.